These sound delicious, I had a bit of leftover xmas pud I'd intended to make ice cream with but then my husband ate it! I definitely want to make bread of various sorts this year. That's ingenious! I've still got a christmas pudding leftover, this would be the perfect use for it. I actually have a whole Christmas pudding left, which I should really start using. Putting it into bread rolls is a great idea! These are an excellent way to start the New Year Nic. Out with the old and in with the new. oh my this sounds like an awesome idea! love it! What a cool idea! How did you think of it? What a clever recipe for rolls! As I have this idea that Christmas Pudding lasts, at least nearly, forever I think you could make these year round. 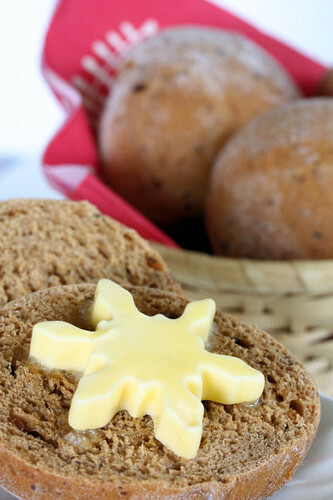 I just wonder if mine would look nearly as good as yours with or without the wonderful little snowflake pat of butter. What a great idea, Nic. It looks like even me, the Christmas Pud hater, would like these! Fantastic pictures as always Nic - and what a great idea! What an excellent and innovative way to use up leftover pudding! I love it. 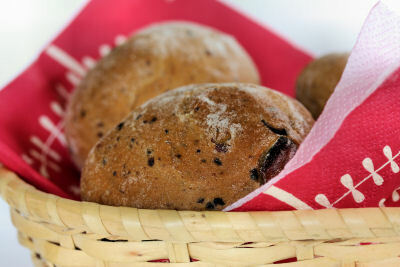 Love the idea of christmas pud in rolls - I wonder if it would work with mincemeat too? The bread dough recipe looks really good, I'm adding that to the 'to-bake' list! Particularly love the snowflake pat of butter! Lovely idea and as always great presentation. Really? Very clever of you! and your bread is so perfect! Wow I am so impressed! Great dinner rolls. Love the butter snowflake too. You are truly amazing in using old flavours & combining them with new ones! Great idea! What a great idea....I love food-cycling!!!!!!! !